Master Chief will arrive online and in person before Halo 4 hits this November. Microsoft has announced a new web series that will premiere prior to the release of Halo 4, representing "the largest investment" the company has ever made in live-action production. 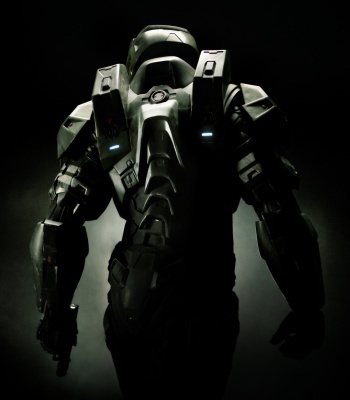 But instead of simply adding to what will surely be a gigantic marketing push for the hotly anticipated game, Microsoft hopes to use the series as tool to introduce the Halo universe to newcomers and, maybe, just maybe, pave a way toward the theatrical movie for which fans have been clamoring since Universal pulled the plug on Neil Blomkamp's adaptation back in 2005. "Every time we do a live-action commercial the audience says, 'We want to see more so that we can explore the Halo universe a little bit more," said Frank O'Connor, franchise development director at 343 Industries. "Demand grew more and more out of the two little vignettes we'd previously produced." The new series is called Forward Until Dawn, and will follow a UNSC cadet's rise through the ranks as inspired by Master Chief's well-known, super awesome space greatness. While the majority of the story will be new, episodes will still make time to cover old ground for the noobies, showing or alluding to events like the humans' initial clash with those pesky Covenant during the first trilogy. Over the course of five weeks this autumn, franchise fans will be treated to five, free, fifteen-minute segments that can be seen either via Machinima or the game's online community, Halo Waypoint. Watch them all back-to-back, and some easy math puts the full experience at an hour and fifteen minutes, just short the average length of a feature film. And though five, quarter-hour episodes do not a movie make, Microsoft considers the production its "next step" in recreating Halo into an entertainment franchise capable of supporting a theatrical feature. "I don't think anybody needs any reminding of [the potential of a Halo film]," said Matt McCloskey, director of franchise business management at 343. "Everyone keeps reminding us of that." Still, with the core franchise currently sitting on a five-year hiatus, and a new development team at the helm for the fourth installment, its perhaps easy to understand why Halo needs a fresh assessment in a new market before anyone is willing to commit millions of dollars into a film. Remember, gamers that were fifteen when the original Halo came out are now twenty-six, and much has changed for both the game and film industry since that initial fan-base blossomed back in 2001.